On December 3, 2014, NASA published a video describing the Orion EFT-1 mission, narrated by a NASA scientist, Kelly Smith. The mission was the first unmanned flight of the Orion spacecraft. Some unscrupulous flat-Earthers decided to turn the video into ‘evidence’ that NASA never went to the moon. They cut down the video to the ‘important’ parts and added in prejudicial narration and subtitles. There are countless of such videos on YouTube, and at some point, it was nearly impossible to search for anything educational about the Van Allen radiation belts on YouTube. They are wrong. There are, in fact, two Van Allen radiation belts. Apollo traversed the outer belt that has lower radiation level in a hurry, while Orion was deliberately sent into the far more dangerous inner belt. They are named ‘belts’ precisely because they are like the real belts. It is possible to bypass the most dangerous parts of the belt, just like Apollo did. 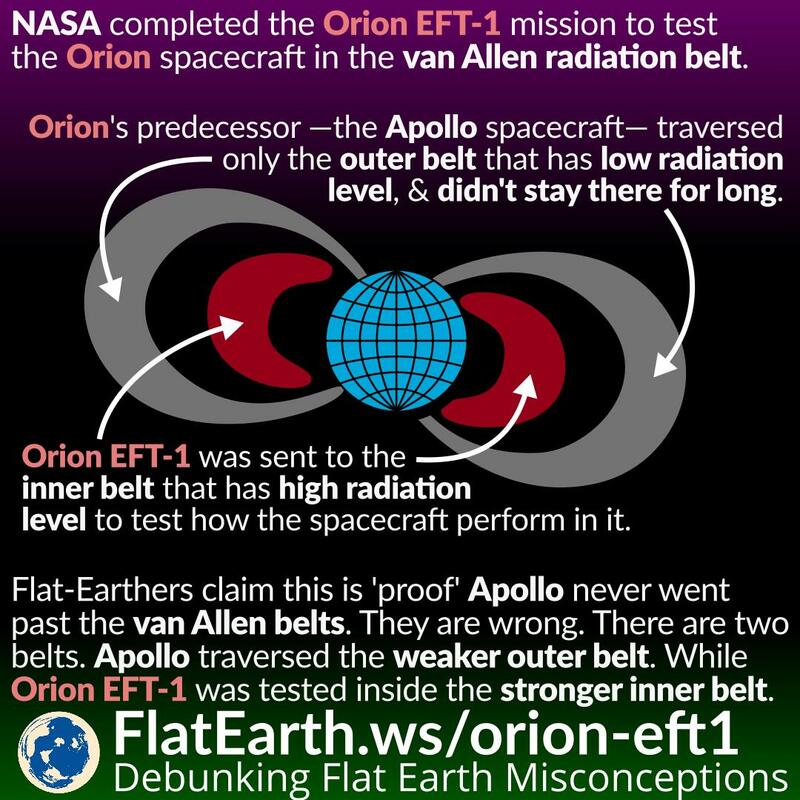 Orion EFT-1 is not ‘evidence’ that the Apollo mission didn’t happen. Van Allen Radiation Belt is a zone of radiation encircling the Earth. 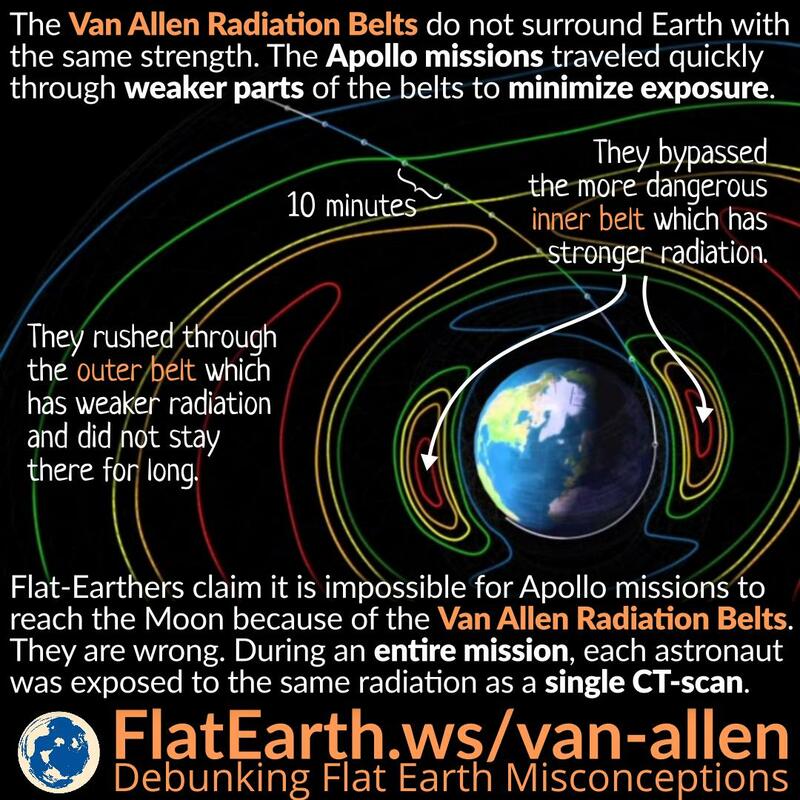 To flat-Earthers, Van Allen Radiation Belt is ‘evidence’ of the impossibility of space travel. 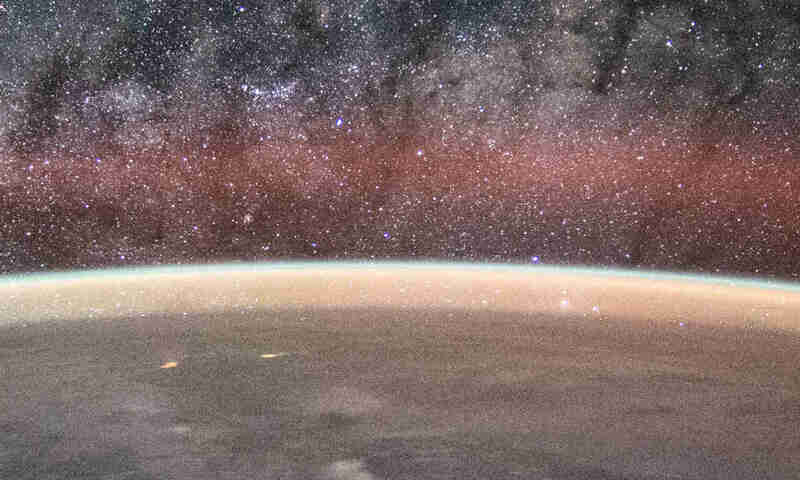 To the rest of us, the Van Allen Radiation Belt is one of the challenges which is not impossible to overcome.